With CANNA SUBSTRA you can grow with precision. Growers have an optimum control over what their plants are offered. It does require a certain know-how, but high yields can be achieved due to the fact that the nutrition absorption can be arranged very well. Also, immediate adjustments can also be made when something is about to go wrong. Not only should a nutrient be specially designed for inert run-to-waste systems, it should also match your type of tap water. 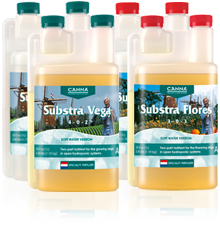 That’s why CANNA developed a hard and soft water version of the SUBSTRA nutrient line. With this choice, the correct amount of nutrients will be delivered to the plants root system and as little as possible nutrients will end up in the drain water; healthy for the consumer and great for the environment.